Sometimes you win and you’re not quite sure how, and other times you lose and you know exactly why. Such is the case of the San Francisco Giants win and the Washington Nationals loss in what was the longest postseason game ever. 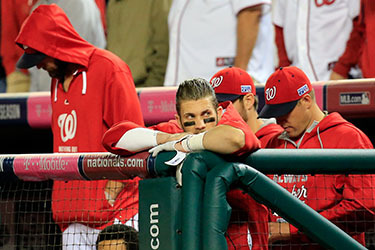 The six and ½ hour marathon classic comeback by the Giants, or should we say give away by the Nationals, is now the epidemy and epitome of how not to win a game. The Nationals had the game in the bag; they had all but won and the game was all but over 8 and two thirds innings in and an out away from a huge, thrilling, series tying victory. But in a sordid twist of fate (and I don’t believe in fate) Jordan Zimmerman, the Nationals ace pitcher, walked Jon Panik to break his string of 20 consecutive retired batters. For seven innings, no Giant batter reached base until the top of the ninth, with two outs. The Nationals manager immediately pulled Zimmerman from the game, only to hand the ball to their closer, Drew Storen, who will go down with his manager as the goat of the game. Storen immediately commenced to give up two consecutive singles and then a game tying double. The score would have been 2-1 had not Buster Posey been called out at the plate. Sometimes doing what you’ve always done to get what you’ve never got is not a good idea. I don’t believe in situational ethics, but I do believe in doing what your gut tells you to do when your gut tells you to do it. Just ask all of spiritual giants in Scripture; you can’t and you don’t and you won’t win playing it safe. You NEVER play not to lose; you ALWAYS play to win. And while I don’t manage the Nationals, I would NOT have yanked Zimmerman one out away from a complete game shut-out. Not. But lest we are too hard on the Nationals, it’s easier to call the game from the announcers’ booth than from the dugout, and it’s easier to play Monday morning quarterback than to make game time decisions. Because as we all know, hindsight is always 20/20. I feel for the Nats. I do. But I also feel that winning is not just “hoped,” it’s willed; it’s not just wanted, it’s expected. And in order to win close, tight games, you have to go with your heart and not your head. Zimmerman should have been allowed to stay in the game. Period. He earned the right to finish what he started and pitch a complete game shut-out in the playoffs. But his manager played the averages, played it safe, and it cost him and his team dearly. So what have we learned? What are the takeaways? What are the Nationals feeling and fretting and privately fuming about now? Yes they’re saying all of the right things publically, but privately, I bet you they’re second guessing themselves and trying to “keep hope alive” by saying that they can come back and win a Five Game series down 0-2. Can it happen? Yes. Will it happen? That’s why we play the game, and keep score. < Previous On The Verge . . .